They don’t really make star-studded holiday specials like they used to, but a little of that yuletide magic, mixed with a little modern irony, is on its way via Bill Murray‘s upcoming A Very Murray Christmas which will premiere on Netflix on December 4. The special was directed by Sofia Coppola and features appearances by George Clooney, Amy Poehler, Maya Rudolph, Michael Cera, Rashida Jones, Jenny Lewis, Miley Cyrus, Chris Rock, Jason Schwartzman, former SNL and Letterman musical director Paul Schaffer (with whom he brings back a little of his lounge singer character), and more. You can watch the trailer below. 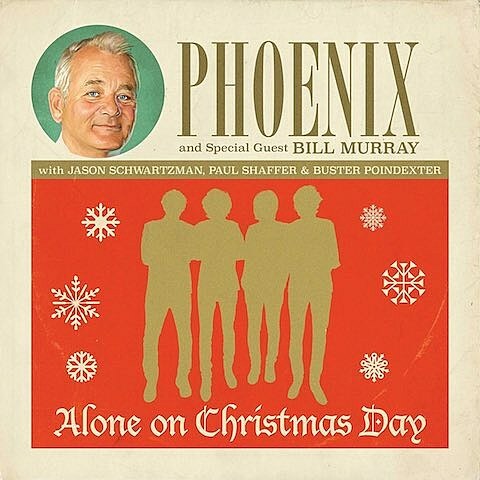 Pheonix, whose frontman Thomas Mars is married to Copolla, also makes a cameo in the special and will release a tie-in holiday single, “Alone on Christmas Day,” that features Murray, Schaffer, Schwartzman and David Johansen in Buster Poindexter mode. That’s the cover art, obviously, above. That 7″ will also be out December 4. Amy Poehler is also joining Tiny Fey for an upcoming episode of SNL.